In Brief: Hike between villages and enclaves in the mountains of Guizhou Province to get a up-close look at the well-preserved rituals, traditions, and architecture of the Miao and Dong (and more) ethnic groups. A traditional welcome to a Miao village. 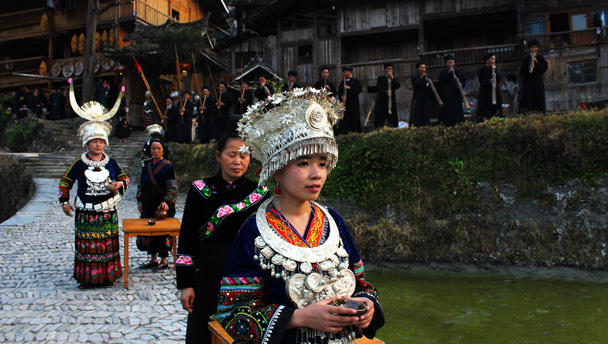 Guizhou is home to nearly 50% of the population of the Miao and Dong ethnic groups, and deep in the mountains many still hold to their ancient customs and rituals: animism, shamanism, courtship and marriage rituals, choral singing, and colourful clothing and jewellery. Timed for the Tomb-Sweeping Festival holiday. Sign up early, before flight tickets run out! Day One—Fly to Guiyang, drive to Danzhai. Tour of Danzhai. Overnight in Danzhai. 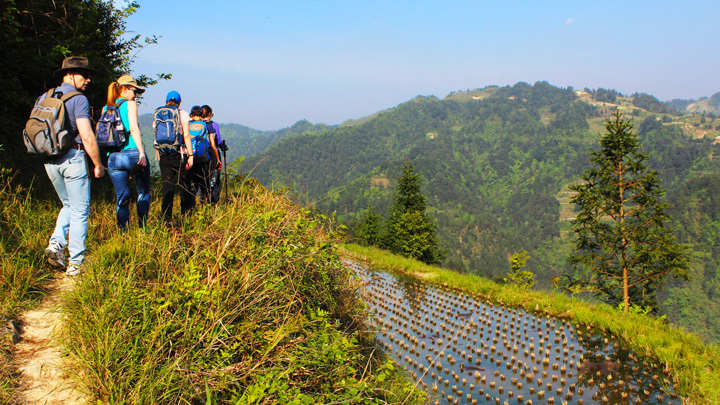 Day Two—Drive to Liujiang River, hike into Shui village, hike over to White Bird Miao village. Overnight in Rongjiang. Day Three—Hiking through forest between villages in Dong area, overnight in Congjiang. Day Four—Hike between Miao and Dong villages in Silver Lake area, overnight in Zhaoxing. Day Five—Tour of Zhaoxing area, drive to Guiyang, fly back to Beijing. Guizhou is a landlocked, mountainous province in central south China, sharing borders with the provinces of Yunnan, Sichuan, Hunan, and Guangxi. The capital of Guizhou is Guiyang, a city of around 4 million located roughly in the middle of the province. Guizhou's population is close to 35 million people, with nearly 40% of the inhabitants part of ethnic groups other than Han Chinese. With all the different ethnic groups, you'll hear a lot of different dialects while in Guizhou. Standard Chinese is the language most people have in common, but in the mountains the local dialects are used in daily life. While rich in culture, Guizhou does not do so well economically. Of the 31 administrative divisions of China, Guizhou ranked last in terms of Gross Domestic Product (GDP) per capita in a 2013 survey. Key industries of Guizhou are timber, forestry, and also tobacco, of which it is China's third-largest producer. Guizhou was made a province of the Ming in 1413, but not willingly. 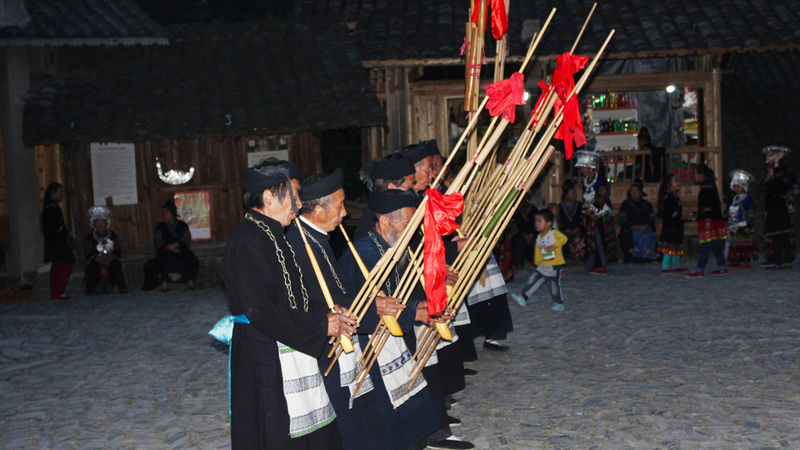 Over the years there were several rebellions led by the Miao and Yao. After the Ming, the Qing took over in Guizhou, and at one point during the Qing Dynasty Guizhou was actually controlled by the Taiping Rebels. The Long March passed through Guizhou in the 1930's, and it was in Guizhou that Mao Zedong was made leader of the Communist Party. Quite a tumultuous history, and that's only going as far back as the Ming Dynasty! We're flying into Guiyang for this trip, but will spend most of our time in the Qiandongnan Miao and Dong Autonomous Prefecture. An autonomous area is a specific area associated with a particular ethnic group, or groups – either by more than 50% of the area's population being made up of ethnic groups other than Han Chinese, or by a historical connection. Some of the areas are province-sized, and others are only townships, and the head of administration of that area will be a member of the particular ethnic group associated with the area. Autonomous areas have more control over local decision-making than areas controlled directly by the government, with more independence for decisions of finance, economic planning, and arts, science, language, and culture. The continuation of a tradition of hunting with rifles in Basha Village is an example of this. The main two ethnic groups in this autonomous prefecture are the Miao and the Dong, together accounting for more than 70% of the total inhabitants. As with much of China, the urban areas are fairly modernised, but by heading out into the countryside we'll get a great look at the more traditional side of southern Chinese ethnic culture – very different to what we see in Beijing. The Miao are the sixth-largest of the 56 different ethnic groups in China, with a total population of around nine million people. Around 50% of that total live in Guizhou Province. There are many sub-groups within the Miao, the most well-known being the Hmong. Some of these sub-groups are not closely linked, and some of the different dialects are not widely understood by those of a different sub-group. 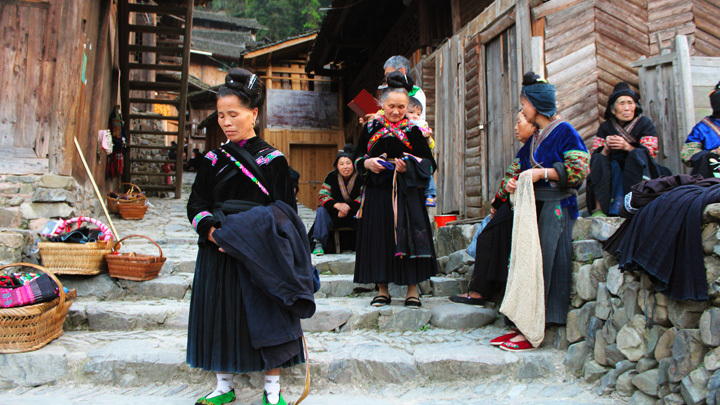 In China, the sub-groups of the Miao are often referred to by the main colour of the women's clothing or some other key characteristic, resulting in names that are either very plain or very descriptive: Red Miao, Black Miao, White Miao; Big Flowery Miao, Small Flowery Miao. 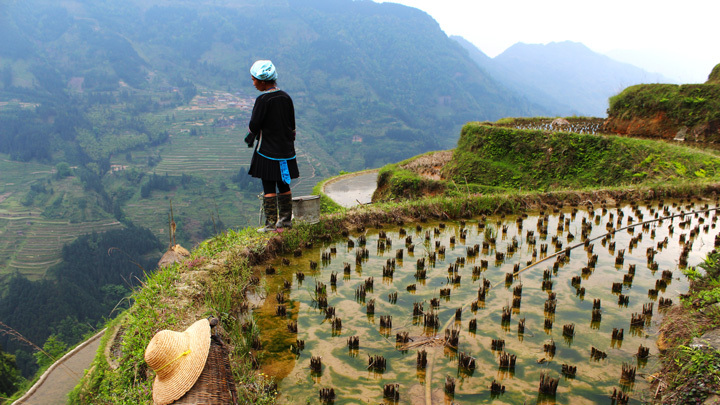 A lot of the Chinese words to do with rice appear to have been borrowed from the Miao, who are perhaps the first rice farmers in China. 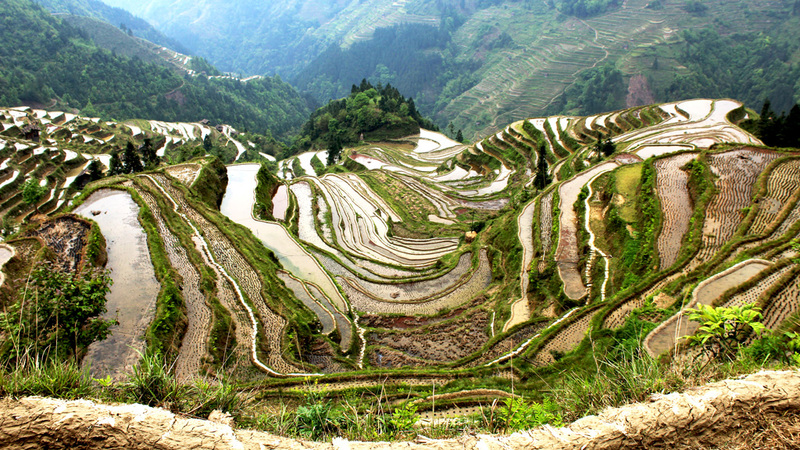 It's not a coincidence that we'll be seeing a lot of rice paddies and terraces on this trip! 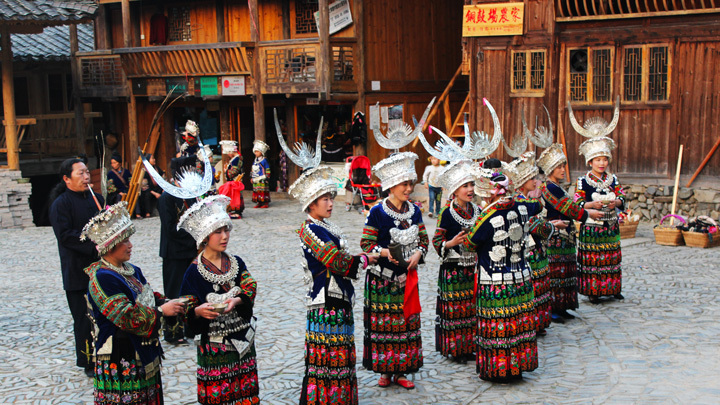 As well as special sorts of clothing, the Miao are also fond of festivals and performances, and we'll see several of those on this trip. 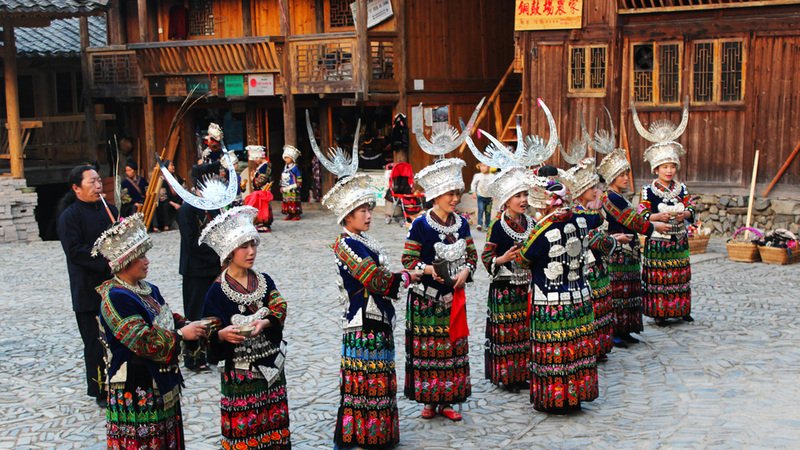 Performances often depict rituals and traditions of the Miao, including animism (the worship of natural objects like trees and rocks), shamanism, and courtship and marriage rituals. We'll get an up-close look at the unique customs of the Miao ethnic group at Basha Village, including the stilt-houses that are a signature style of their architecture. The Dong are the eleventh-largest of China's ethnic groups, with a total population of some three million people. As with the Miao, around 50% of that total live in Guizhou Province. The Dong do not have as many sub-groups as the Miao. Their language has two main dialects: North, and South. They are famous for a rich tradition of song, and their 'polyphonic choral singing' is listed by UNESCO as 'World-Class Intangible Cultural Heritage'. Common topics of the songs include love songs, drinking songs, bride's songs, and morning songs, and you'll definitely hear some of this special singing during the trip. The Dong also hold to old traditions and superstitions, with elaborate rituals for courtship, weddings, and funerals. Some are animists and/or polytheists, and their folk religion includes divination from rice grains, bamboo shoots, and the entrails of chickens. A typical Dong village has 200-300 homes, and in the village you'll usually find stilt-houses, covered "Wind and Rain" bridges, a communal fishing pond, grain stores, and shrines for Sa Shui, the female deity who is the most important of the Dong gods. Another typical feature of a Dong village is a pagoda-like Drum Tower. If a Dong village has more than one drum tower it is because different clans in the village have built their own tower. The larger and fancier the tower, the more well-off that particular clan. It's not a Beijing Hikers trip without at least a little bit of hiking. As with the hikes we do in Beijing, a long walk between villages in the countryside is an excellent way to get a close look at the real lifestyle of the people of China. Guizhou has more overcast days and rainfall than any other part of the country. There's a relatively large temperature difference between day and night, caused by all the hills and mountains. In April, the average temperature during the day is usually around 21°C, and around 13°C during the night. The real rainy season here starts late April, but definitely bring your waterproofs in case the rain comes early! We will be staying in 4-star and 3-star hotels for this trip, the best places we've been able to find. You’ll be sharing a room with another hiker. If you'd like a room to yourself, it can be arranged at an extra cost of 500 RMB for the whole four nights, if a room is available—usually not a problem! We fly to and from Guiyang for this trip. Transportation between the various scenic locations will be by private bus. We will take most of our meals at restaurants in the areas we visit, and/or at the hotels or guesthouses. On one of the days we include a packed lunch for a hike. Bring some spending money for snacks during the trip. Please let us know if you have any special dietary requirements or food allergies. 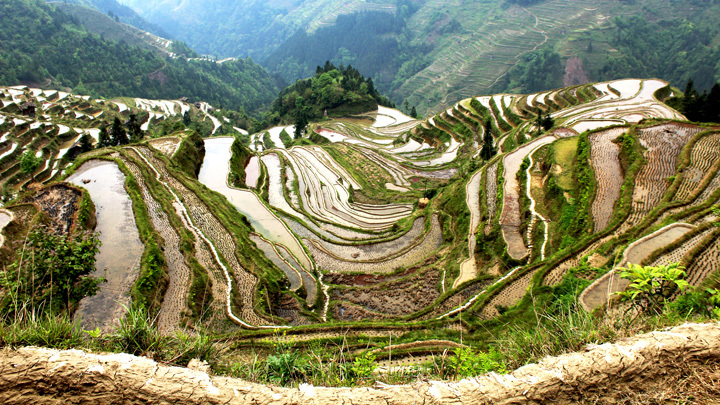 Rice is one of the main staples in this area, and some say that Guizhou is one of the places where rice was first farmed in China. We'll be eating a lot of rice on this trip! Comfortable, sturdy shoes (hiking boots are strongly suggested), and a spare pair of shoes to change into at the end of the day. We have long and short hikes almost every day, and most of the trails we'll walk are dirt trails, and they can be muddy and slippery after rain. Bring a few changes of clothes, including something warm for night time. It's highly recommended you bring a waterproof outer layer and rain jacket. Bring you camera and chargers for all your electronics. Bring a backpack to hold water and food for the hiking. Bring a duffle bag or suitcase for the rest of your things – we can leave that at the hotel or on the bus. Meals, water and snacks are provided; bring extra snacks if you like! Bring personal toiletries (shampoo, toothbrush, toothpaste etc) and small towel. Bring any personal medicine you might need. Your guide will have a basic first aid kit. Thirty-five photos from a trip spent trekking around the mountains of Guizhou Province—hills, mountains, and the folk traditions and customs of the ara. A photo album from our visit to Guizhou Province in April 2015.